I have a beef with Netflix, but I will start out with another related rant. For some reason, the TV industry keeps pumping out 16:9 TVs when the movie industry keep pumping out 21:9 or similar movies. Of course, directors, knowing this, make sure nothing important is happening in those itty bits left over so that the movies may safely be cropped to 16:9 without lessening the experience. This is what many rippers do. They simply crop the film from its original aspect ratio to 1920x1080. I wouldn't mind this so much if the producers actually produced their movies in 1080p! Again, as a compromise to the 16:9 fad, movies that do not have a 16:9 aspect ratio are letterboxed to 1920x1080, meaning the actual resolution of most films is around 1920x810, an aspect ratio of 21:9. This is why I hate rippers who crop out the "unimportant bits" and scale the movie up to 1080p. Real 1080p is 2560x1080, a difference of 1,209,600 pixels-more pixels than a 720p monitor.The result is a 56% quality loss when scaling down to 16:9 resolution. But where does Netflix tie into this whole spiel? Most video players are capable of basic video frame adjustment as demonstrated in this image. If there are black bars on the top and bottom, you set it to "Touch Window From Outside." 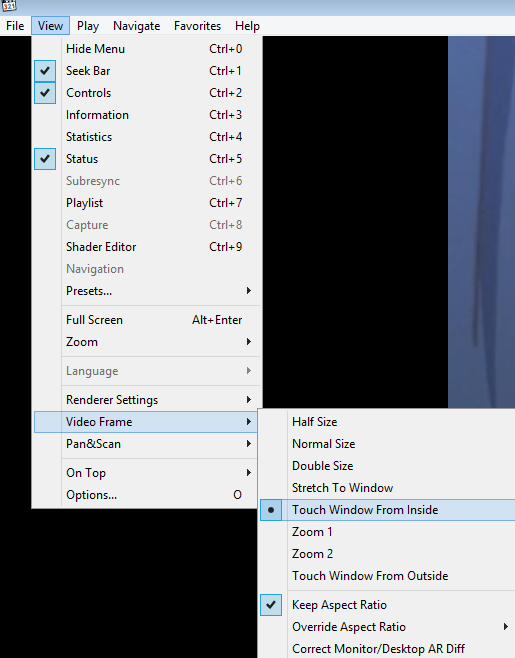 If there are black bars on the left and right, you set it to "Touch Window From Inside." This feature is extraordinarily useful for people with cinematic 21:9 monitors because it allows us to watch letterboxed films with high original aspect ratios without the terrible blackness that you otherwise get. Take a Look at these two images to understand the difference it makes:  vs. . You can imagine how annoying it would be to watch letterboxed movies on a 21:9 display. This happens to be what it's like to use Netflix for movies. The majority of the movies on Netflix are letterboxed with no option to adjust the video frame. I don't believe there is any excuse for this. Every other modern-day video playback software has a feature to adjust the aspect ratio. If youtube can do it, so can Netflix. Here's hoping 21:9 does to 16:9 what 16:9 did to 4:3.